I need to know this because, while this book is going to be a lot of things — an adventure, a game-changer, a how-to manual for the family meal — it is first and foremost going to be a personal challenge, a commitment. Loyal DALS readers have heard the story of The Great Dinner Rut of 2006 — that period, back when our girls were 3 and 4, when Andy and I were drowning in a sea of plain. Plain pasta, plain burger, plain chicken, plain pizza. Our once-solid dinner rotation had been reduced to what you’d find in your average minimum security prison. On any given night, we’d have a breakthrough — Flounder! Abby ate flounder! — until the next time we’d present it to the Li’l Lady of the Manor and she’d drum her fingers against the table and stare at us with cold, cold eyes, as if to say “For real? You think I’m gonna eat that?” I don’t want to go on too much here — you guys know the deal — but for two working parents who loved to cook and just wanted to end the day with a glass of wine and a meal that wasn’t beige, the situation was far from ideal. “It’ll get better,” everyone told me. “You just have to wait out the toddler years. You’ll see!” But I didn’t want to wait out any years — years! —I wanted to eat real food again, food that I was excited about cooking and introducing to my kids. So I took control of the situation. One night, I made an announcement: We were going to embark on an adventure. (“Adventure” seemed like a key positioning strategy.) We were going to cook thirty new dinners in the next thirty days, and the only thing I asked was that they had to try a bite of every single one of them. One bite. They didn’t have to like every meal, but they did have to try every meal. It always surprises me how game kids are in situations where you least expect it. But not as game as Andy and I were. We got into it — scouring old cookbooks for recipes we’d always wanted to make, texting ideas back and forth on our commute, asking anyone we saw what their go-to dinners were. I’m talking about dedication I hadn’t seen since the days when we were planning our honeymoon. We came up with a line up and got cooking. Was a little nuts for two working parents to take this on? Yes. Did we almost give up along the way? Absolutely. Was every meal a hit? Not exactly. Abby puked up the trout (day 19) onto the dinner table and Phoebe moved her chair to the living room when we placed a bowl of gnocchi in front of her (day 16). But did it transform the way the kids (and their parents) thought about dinner? Well… I hate to sound all gimmicky here, but yes. What we discovered was that Family Dinner is a contract. You buy in, or you don’t. This can mean lots of things to lots of different families, but for us, it meant cooking most nights and constantly looking for ways to keep it fresh. We didn’t know it then, but this project set us on our way, expanded our horizons, established dinner as a priority in our lives, and killed the chicken nugget dead once and for all. Weekly meal plans that show you how to put all those recipes together over the course of 30 days — or even just seven days if that’s more your speed. In short, it’s got everything you need to help bust you out of your own dinner rut. Even when you are working full time. Even when you would rather crawl into a dark hole than think about dinner. Over the years, I have received so many emails from readers asking me: I am so busy and overwhelmed, and I want to put dinner on the table. How do I do it? Where do I start? This book, I hope, provides an answer to that question. So what do you say? Are you in? Please say yes! 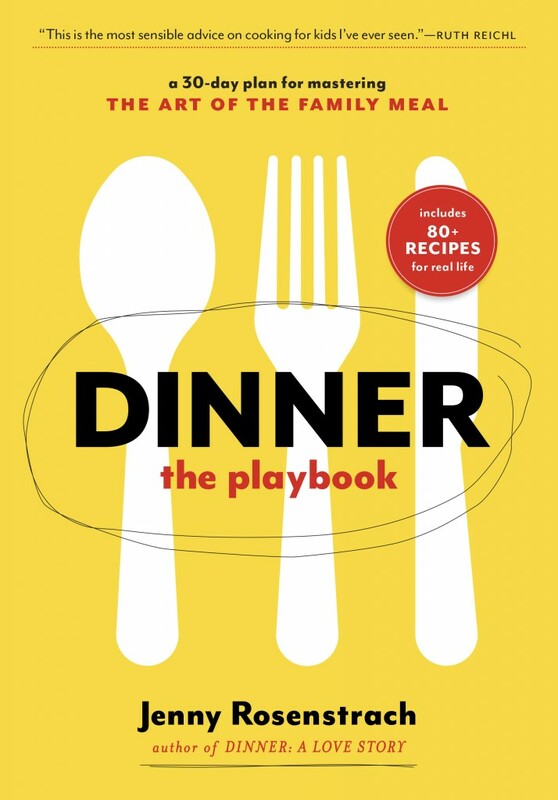 Dinner: The Playbook will be out in late August — just in time for back-to-school bootcamp — but is available for pre-order with all the usual suspects: Amazon, Barnes & Noble, Indiebooks, and Ballantine. Yes! I’m in and so ready for the challenge. The cover looks great, at first glance it reminded me of the Little Golden Books! Seems appropriate to me given that both those books AND yours ae classics. I am off to Amazon to pre-order! And for the record, I still haves Xerox copy of your 30 Meals in 30 Days article that is pocked with splatters and deliriously scribbled comments. It will be a relief to have it in book form. Congratulations!! I’m in! I don’t have kids, but I know people who do and recommend your book to them all the time. 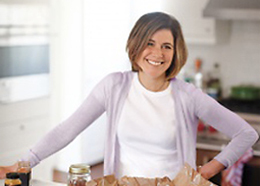 Even as a single lady, I believe in what you’re doing and your recipes work! Annnnd I just pre-ordered. Congratulations on the new book, I will be counting down the days till it ships! Congrats! It looks great. I have one eat-anything-tasty kid, one beige-food-only(the puker), one wild card and a little one who copies one/any of his brothers each evening. We really need to do that thirty day thing, and maybe now that you’ve brought it up, we will! Thanks for the reminder that its not all plain sailing in any house. Hooray! You’ve done it again. What a smart, gorgeous book. I am in. Looking forward to the blast of dinner energy right before school starts. WTG, Jenny! Thank you Thank you!!!! I poured over your first book, and use it all the time. My husband and I committed to family dinner when we were married (and didn’t really have to think about it too hard), and it’s been one of the best family-rearing decisions we’ve ever made. Thanks for helping a girl out!!! Yessssss!!! I am so excited! Off to pre-order! And a few more exclamation points for good measure!!!!!!! Preordering right now – I am in! I actually just re-read your first book last week, and I’m making your fish cakes tonight for dinner. Thanks for the inspiration! I can’t wait to see more! Oh, hooray! Congratulations, Jenny. And August is the perfect pub month. I’m a working mom of three kiddos (5,3,1) and making dinner for my crew is, without a doubt, the most meaningful thing I do every day. Call me crazy, but I kind of enjoy the challenge — organizing the shopping list by grocery store aisle, reserving the newest cookbooks at the library, writing the menu on the chalkboard, making everybody try everything. I know your cookbook will help me step up my game, and I can’t WAIT! DALS (the book) is practically a sacred text in our house and it will be fun to add to the canon. I’m in! Looking forward to reading this by the beach (with a dark & stormy in hand, of course)! Yes, I can’t wait! We’re definitely in the hot dogs/chicken nuggets/pasta rut. Please, though, make them easy and QUICK. I spent 45 minutes making pad thai with tofu for my twin 2 1/2 year olds only to have one try a bite and “not want it” and the other not even try. I vowed at that point to only spend up to 25 minutes on dinner. Hooray! Just pre-ordered. This book is just what I needed. Our family is in a dinner rut and I can’t wait to try the challenge. Because of your recommendations, I subscribed to a CSA for the summer and fall season for the first time. I am looking forward to feeding my family well. Thanks! Of course I’m in! Congratulations, Jenny! The book looks gorgeous and I’m sure it will be brilliant. Can’t wait to dive in. We are sooo in! Just pre-ordered and can’t wait for it to arrive so I can pour over every page. Congratulations!!! I’m in! Counting down the days until I can get a copy of the book. Ha, puked it up on the table! That is definitely a story to bring back during her teenage years. I’m so excited for book #2! We literally refer to the first one as “the magic cookbook” at our house because everything in it is so delicious. And since our first baby is due in September, I have a feeling this will come in handy! Yes! This is awesome–thank you, Jenny! YAY! This looks fantastic. Very exciting! Love this! I will pre-order and anxiously await it’s arrival in August! I really want to see those weekly meal plans and tips for picky eaters. Ahhh! So excited! Love the cover. Congratulations! Jenny, congratulations! Well, I have to tell you, for all it’s worth, my three daughters totally skipped the “picky eater” stage. Maybe this has something to do with the fact that as a divorced full-time working parent, with day-care expenses added to the burden, and no child support, we had so little money that there was no way any food could be wasted with real or imagined likes and dislikes. They had good appetites and they were a good-spirited bunch–we have wonderful memories of the times we prepared meals together. And grocery-shopped and gardened together. I love your writing—yet, I hesitate at your focus on a “Trader Joe”/ “Whole Foods” audience. 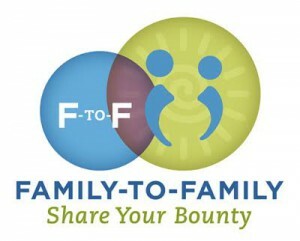 I’d love to see you include folks who are struggling to make ends meet, financially. Fabulous! Wishing you all the best with your latest book project. Destined for success. I look forward to reading it. I’m a fairly new DALS devotee (to both the book and the blog)… but I CANNOT GET ENOUGH! You have brought so much joy and fun (not to mention delicious recipes) back into our family dinner routine– and my whole family thanks you and yours! We’re so happy for you all, and wish you nothing but continued happiness and success!! I am so in! This is truly exciting and I can’t wait to get my copy – hello Mother’s Day gift! Your first cookbook is my favorite cookbook ever so I really look forward to this new one. The cover looks great. I agree with the commenter who said that the spine reminded her of a Little Golden Book. That’s the first thing that popped into my mind when I saw the cover. Congrats! I’m still trying new recipes from your book. Last week it was porcupine meatballs that my kids didn’t like the look of, but loved the taste. Thanks for doing what you do! I AM IN! Also, this was already pre-ordered on Amazon before the put the cover up! I am so ready for this and congrats on this! I still use your other two books every week, but I can’t wait for this one! Hi Jenny, I’m so glad you did this. 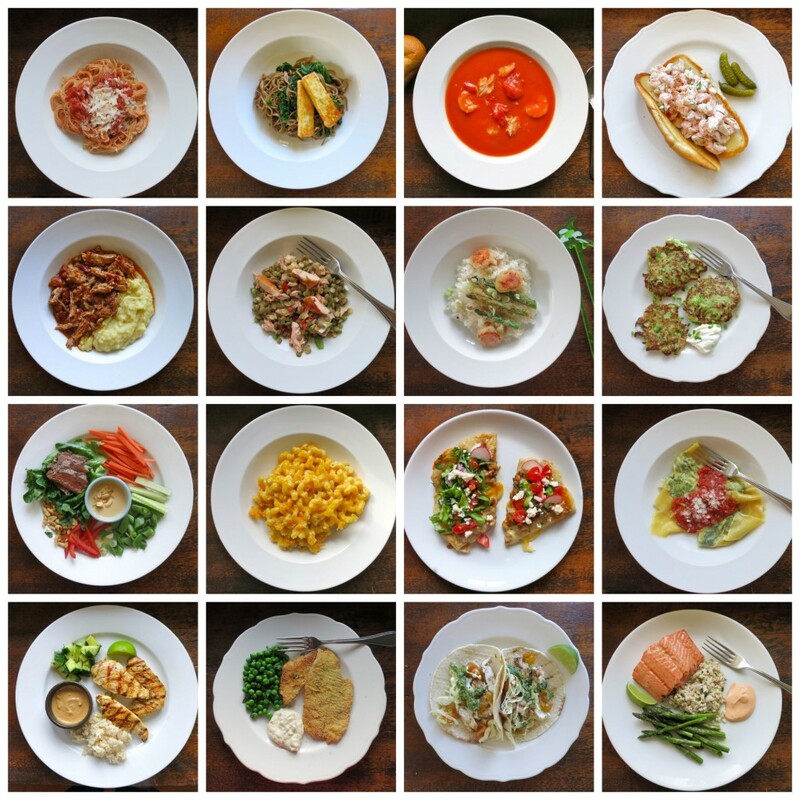 How inspiring to cook something different every day for 30 days. Love the reality of the situation, too. A child moving their chair to another room sounds like our house. Congratulations! Yay – this looks like another amazing creation…count me in! i cannot wait! way too excited! Happy happy day! Couldn’t be more thrilled, for you and for all of us! Yeah! I am so excited! Your first book was awesome, and I know that this next one will be just as great! I am up for the challenge! I’ve got 4 active boys that all eat differently (a foodie boy, and one thats picky, you know how it goes). Between their baseball and karate schedules and our work schedules, we can use some guidance. WE ARE IN! I am pre-ordering now! Thanks Jenny for getting this out there! So exciting! I can’t wait. I just wish I could get my hands on it sooner. We are seriously in the dinner doldrums right now. Congrats, hooray and way to go! Absolutely! I’ll read it just for enjoyment, and cook from it because your recipes are always great, and I don’t even have any kids :-). I am SOOO with you. Just pre-ordered. So nice to think of it arriving in August, for so many reasons! This news has totally made my day. Great writing along with new ideas for dinner is so exciting. Congrats to you! Yes! I’m in! And congratulations. Definitely in!!! Preordered and can not wait until August. 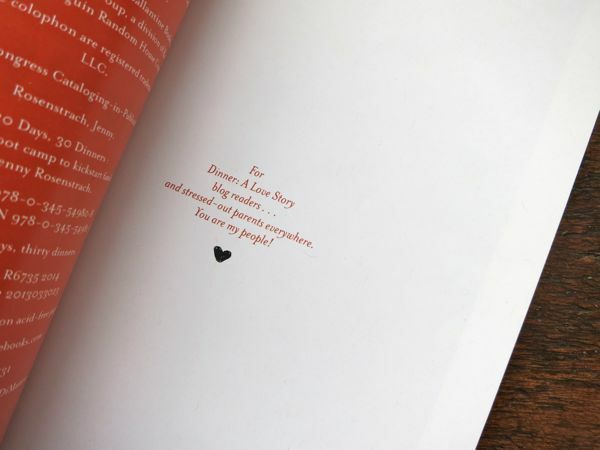 My copy of Dinner: A Love Story is well loved and always a favorite dinner resource! How exciting ; I’m in! Congrats – I love the cover as well. Reminds me of home. I’m totally in! Just placed my pre-order with Amazon. My girls are almost 3 and almost 6 and I feel like you are speaking my language! Thank you, Jenny! I am joining the chorus of happy people celebrating Book 2! I don’t have kids yet but I am recently married and we are freezing flattened Ziploc bags and mastering the weekly shop, DALS style. So grateful for your voice on the web. We’re in. Have been waiting for this book for two years since we’ve basically already cooked everything in DALS. Cannot wait! You guys are doing your thing and it’s so fun to watch (and read!). Although my little one is just baby and I pray she’s never picky (hardeharhar), I want this on my shelf ASAP! I can’t wait. I CAN’T WAIT! I love to cook and love cookbooks but DALS has been my “go to” for months. I will be pre-ordering! Congrats! I am clearing a space for it on my cookbook shelf! Jenny, I love the cover!! I’m in. DALS has been my dinner bible for a couple years now — so much so that the binding has failed and the pages simply fall out if I’m not careful. My husband made me an honorary Swede the first time I made you Swedish Meatballs, LOL !! So looking forward to your new book. Congratulations! I’m in! (and I’m not usually one to say ‘yes’ to these sorts of things). And PS > it’s beautiful! Congratulations!! I am so excited about this! Thank you for working so hard on yet another beautiful book. I’m so excited! Your first book and the one and only cookbook I’ve ever read cover to cover. It is my food bible, I love it so much! Cannot wait for this new book, August better come fast! Can’t wait! I read DALS 3 times in a row…because it truly was a love story. Clearly, it would have been weird to read a cookbook cover to cover 3 times in a row, but not a love story. I could. not. be. more. excited. I’m going to buy like 10 copies, 1 for me and 9 for my closest friends. I love the cover!!! Great work – congrats…! I just pre ordered it through Amazon! I don’t know if I can wait until August. We are in a major dinner rut here in Boston! I am really excited to read it! Hi, I’m a student at Boston University and we are developing a new cookware and would like to listen to some opinions from our potential consumers. I would be greatly grateful if you could take a few minutes to help our team fill out this survey! Thank you! Look forward to it – we have hit the picky eater phase of toddlers and I need inspiration! Tator tots don’t go so well with red wine…and I miss enjoying meals. Sweet! and a great subtitle. Well, I don’t know how ANY cookbook could be better than DALS, but if you wrote it, I’ll give it a try. Congratulations on the new addition. In. So, so in. Can’t wait until August! Yay, congrats!!! So in, so timely! Oh man, I have to wait until August?! So excited for another book! We are IN! I’m in! And congratulations on the new book! I can’t tell you how thrilled I am about this! Absolutely, I am IN. Why are you making us wait until August?? 😉 I’ll be buying it from my local bookstore then…whatever that may be after we move this summer. I can’t wait to get my hands on it and get it covered in cooking spatter. Thank you! Yaaaaay! is what I said when I saw this! I am with you! Can’t wait to get my hands on it. Congratulations! Congratulations! It looks beautiful and the concept is right up our alley (two kids under 3, parents who like real food…). I have to say though, I am missing blog posts with recipes. It seems like they’ve been kind of sparse lately? Or is that just me? Clearly, you’ve been at work on a book and such, but a mama needs some real recipe inspiration now and then! I’m in and I can’t wait. And I don’t even do the family thing. It’s me, myself and I (and often my bf) and I use your cookbook ALL THE TIME. In fact, I’ve probably cooked more recipes out of it than any other. I can’t wait for this book to come out. I have picky eater #1 and #2 in my home and really need them to start eating what we eat, STAT. I’m with you! My own (not so tiny) table terrorists are in need of an adventure. I love to cook, love good food, and somehow fail at getting them on board that happy train. We are in that big parental no-no of two seperate dinners to keep the peace and satisfy my need for real food. A tried and true game plan sounds excellent! Thanks, Jenny! Pre-ordered! I am so looking forward to this. 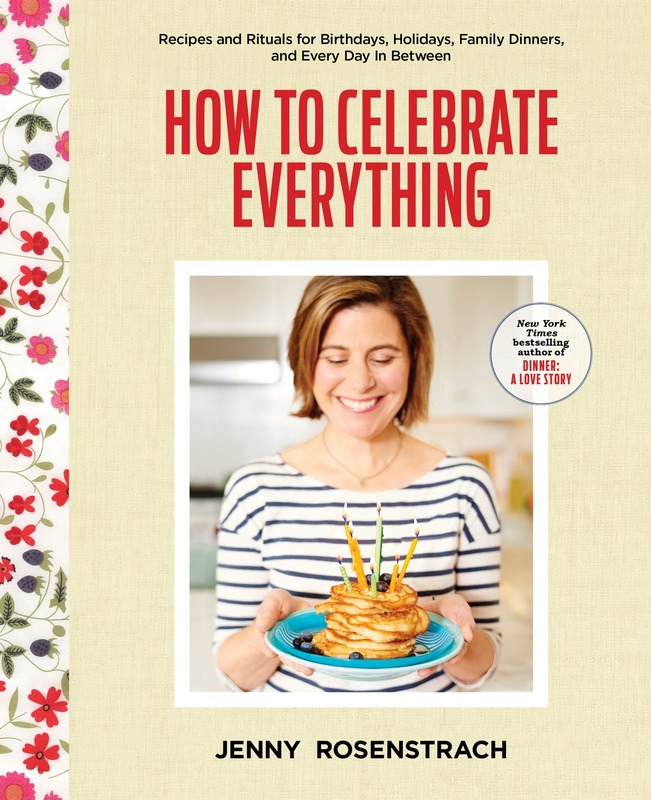 I am beyond excited for the new cookbook! I am making at least 2 recipes a week from your old cookbook and I’m 9 months pregnant and have made all the recipes you made for the freezer when you were expecting.. So excited! Congratulations Jenny! I can’t wait!! I’m all in!! Thank you Jenny!! I’m so In! Can’t wait.